Dozens Of Deaths Reported In Philippine Resort Attack : The Two-Way Local media say bodies were found there after what police call a possible robbery attempt. Though ISIS claimed responsibility Friday, police continue to maintain that there's no evidence of terrorism. Local media report at least 34 people have been found dead by suffocation in a luxury resort complex in the Philippines on Friday. Police have said they believe the man was robbing a casino when he fired a gun at Resorts World Manila, then used gasoline to burn gambling tables before stealing chips and escaping. 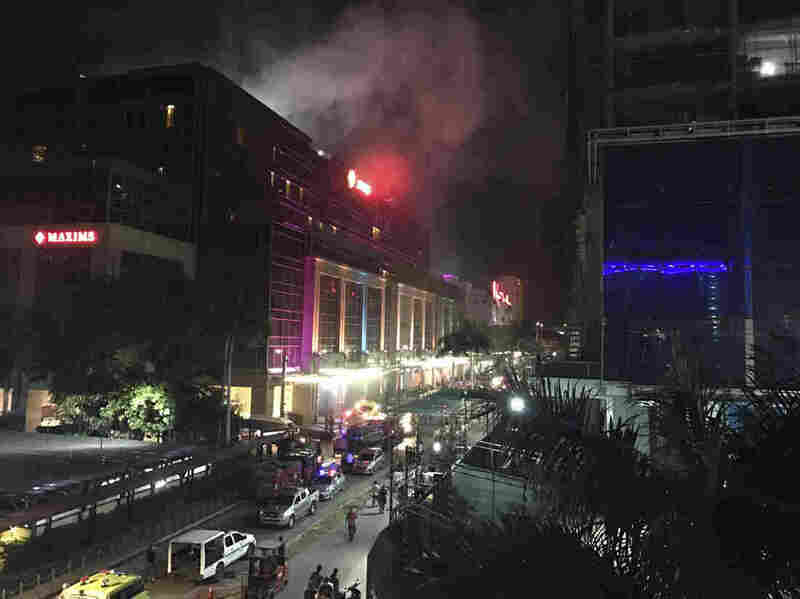 Philippine National Police Director General Ronald dela Rosa told reporters that police searching for the gunman found him dead of apparent suicide in a hotel room in the complex. Dela Rosa said the man had covered himself with a blanket, doused it with gasoline and set it on fire. "We're looking at robbery as an angle because he stole, he barged into the storage room for casino chips," Dela Rosa said, according to the local news service Rappler. "He took the chips, put them inside his backpack but eventually left it. We have recovered the backpack." He says law enforcement has seen CCTV footage that appears to show the lone gunman "not hurting anyone," and therefore committing an act of terrorism, The Associated Press reports — though a police spokesperson referred obliquely in a statement to "the loss of lives due to suffocation" without explaining further, Rappler reports. The police chief confirmed his original statement to the AP that there is "no concrete evidence that the attack was terrorism" — despite President Trump's opening remarks while announcing the U.S. withdrawal from the Paris accord on climate change. During those remarks, he referred to "the terrorist attack in Manila." "We see no terrorism in this act," the spokesperson said. "We see this as an isolated incident confined to a disgruntled individual." This contradicts a statement issued Friday by ISIS through its news agency Amaq, which claimed responsibility for the attack. "They can always claim whatever they want to claim," local police chief Oscar Albayalde said Friday, according to CNN. "They have this reputation of claiming all atrocities all over the world to perpetuate themselves to gain global notoriety. There is no truth that the incident is a terror act." Police cordoned off the area near the Ninoy Aquino International Airport shortly after the attack began, according to the AP. Resorts World Manila is located essentially across the street from the airport. It is home to a casino, four hotels, four bars, eight restaurants, a movie theater and a mall, according to its website. "We ask for your prayers during these difficult times," it wrote on Twitter. Meanwhile, as The Two-Way reported, the Philippine military has been battling ISIS-linked militants that seized parts of the southern city of Marawi last month.